This page summarizes the sites that feature Roman roads. This page summarizes the sites that feature Roman roads, and provides information on the Roman roads. The Roman engineers perfected the art of road building, and enabled them to effectively manage the vast empire by improving the links between the cities. They were the greatest road builders of the ancient world, which may be one of the factors the Romans sustained their empire for hundreds of years. At the peak of the empire there were over 85,000 KM of roads which served military and commercial traffic, which was unprecedented in the ancient times. The default width of the road was 8ft (2.4M). 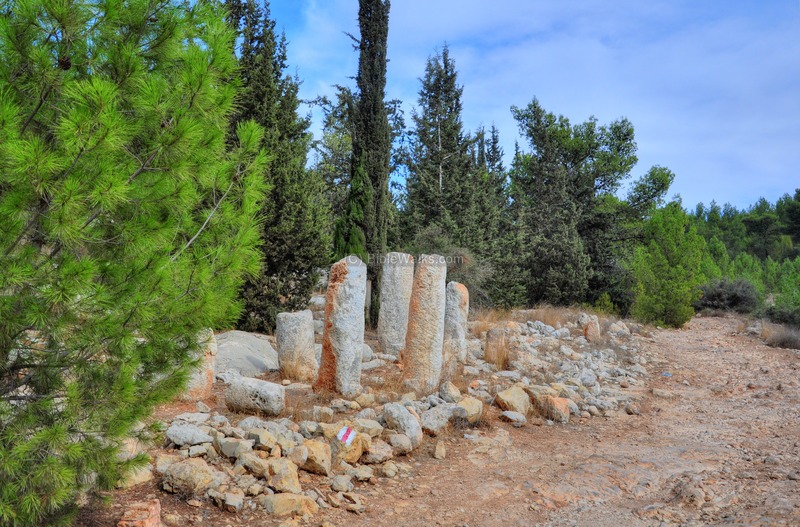 Milestones were placed every about 1.5KM, and were usually circular columns (50cm diameter), 1.5M high and standing over a rectangular base. The Romans also established well planned cities and based them on a matrix of high quality paved streets. Some of the streets were colonnaded with shops or houses on both sides. These are covered by a separate web page. The Romans conquered the Holy Land in 63BC and ruled for over 700 years. Among their major effect on the land and its history was the quality of the roads. During the great revolt (66-74 AD) the Romans constructed new roads to make their long supply lines more efficient. Their mobilization of the army required better roads than were constructed previously. Josephus Flavius, the commander of the Galilee revolt which later wrote about these tragic events, describes one of such constructions ("Wars of the Jews", book III chapter 7 par. 3): "Accordingly, he sent both foot-men and horsemen to level the road, which was mountainous and rocky, not without difficulty to be traveled over by footmen, but absolutely impracticable for horsemen. Now these workmen accomplished what they were about in four days' time, and opened a broad way for the army". Josephus also describes the heavily armed Roman Army, justifying why they required such roads - see the reference below. The Peutinger Map (Tabula Peutingeriana) is a medieval map which was based on a 4th C Roman military road map. It is named after Conrad Peutinger, who found it in a monastery and published it in 1507. The map was made in the 13th C, and copied from an older map. It is drawn as a long scroll (6.82M x 34 cm), arranged in the direction of England on the left side and India on the right side. The map shows the major roads, with indication of the cities, and geographic highlights (lakes, rivers, mountains, seas). Along the links are stations and distance in Roman miles (about 1.5KM per mile). In the section shown below is the area of the Holy Land, drawn in a rotated direction (Egypt on the left, the Mediterranean sea on the top, and Syria on the right). The major cities are (from left to right): Jerusalem listed as "Helya Capitolina formely Herusalem" (drawn as a double house, with Mount of Olives as "Mons Oliveti"), Jaffa as Joppe, Caesarea Maritama as Cesaria, Dor as Thora, Beit Shean as Scytopoli, Acre as Ptolomaide, Tyre as Tyro, Sidon as Sydone, Tiberias as Tyberias (including the Sea of Galilee as La(cus) tyberias). The roads are shown as brown lines between the cities and stations. Roman roads and streets are found in many of the Holy Land sites. The following table lists the sites of Roman roads that are featured in BibleWalks. Click on the site's name to see more information on each site. The Romans linked their center of administration, located in Damascus, to the Galilee. They set up roads that enabled an efficient route through the tough terrain. 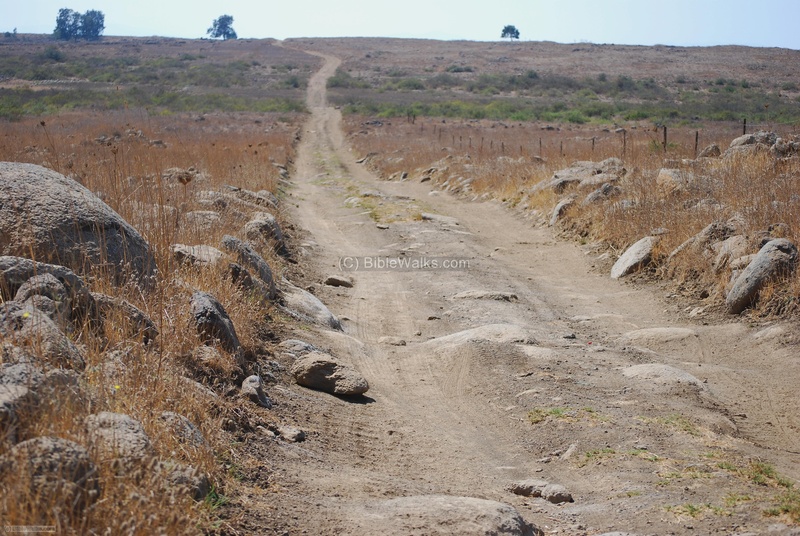 Traces of such roads can be seen in several locations in the Golan heights. The photo on the right shows the road through Kanaf valley on the south of the Golan heights. A section of a Roman road is located north of the ancient town of Usha (which was, for some time, the place of the Sanhedrin during the Roman period). This section was constructed during the Great revolt (68-70AD) by Roman soldiers, and connected Acre to Sepphoris. A section of the road is located north of Usha, between Kiryat-Atta and Shefaram. An inscription on a rock ("CAB", seen on the right) may have been an ancient Sabbath zone marker. 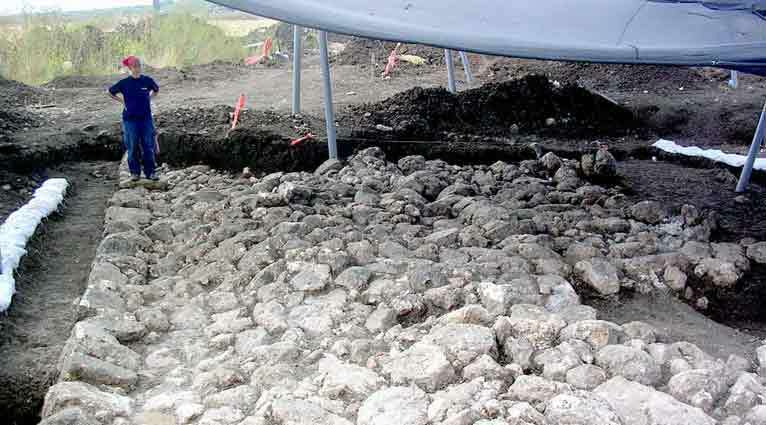 Excavations were conducted in November 2007, and a deep cavity in the sandstone bedrock - at a width of about 3M and depth of 2M into the rock - was found in one of the pits. This may be, perhaps, a section of the ancient road that passed at this point and was cut into the rock. Khirbet Shimshit is a Roman/Byzantine village 3KM south-west to Sepphoris, on a hill overlooking the Zippori creek. A Roman road passed at its western foothills, the main road from Sepphoris to the south (Legio/Megiddo). The Roman road traversed the foothills on the western side, and a section of that road is seen below, although it is partially covered by the leaves. 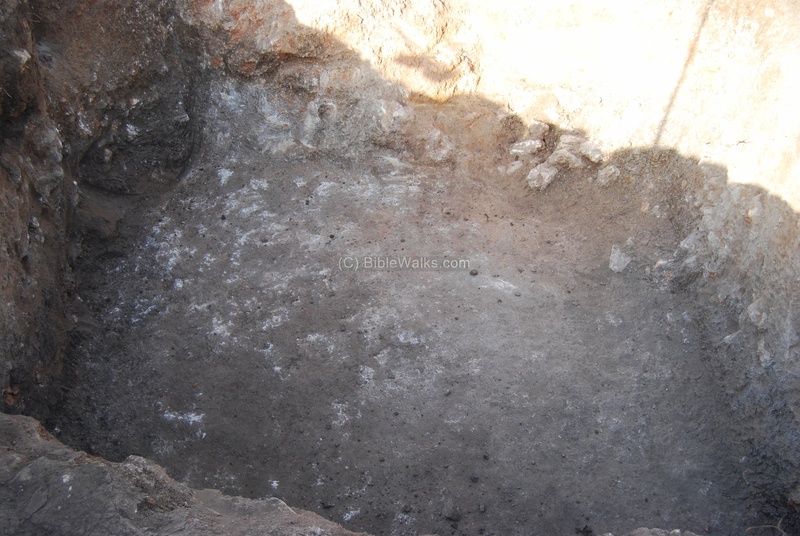 A 12M section of the 6M wide road was excavated. The road was composed of a floor covered with small stones and pebbles. On its north (right) side there are two rows of stones, laid side by side: larger and medium stones (0.55-0.3M) on the exterior, and medium stones on the interior. 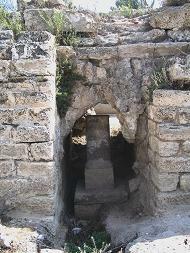 Tell Kisson In the 2006 a section of the Roman road from Acre to Sepphoris was excavated north-west of the Tell. Ma'ale Akrabbim The following photo shows a biker riding on the ancient rock-cut Roman road Ma'ale Akrabbim, one of the spice route passes in the Negev desert. Arab El Heib A small section of the road from Tiberias to Sepphoris can be seen in a field south-west of the Arab El Heib village. 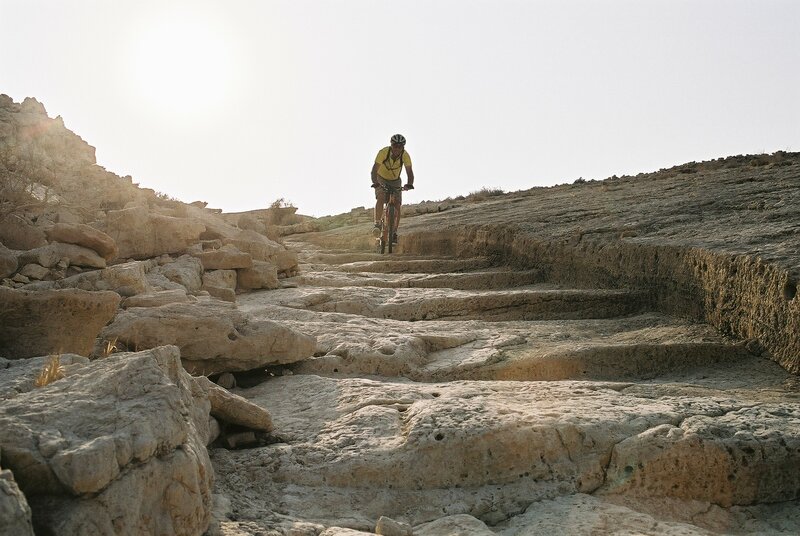 This route goes through the Yiftachel valley, and reaches the Netufa valley. A group of milestones were also found at the site. Ibilin creek A Roman road led from Acre, through the valley of Ibilin, to Hannathon and Netufa valley. Tell Dan A Roman road from Tyre, through Banias, up to the Golan heights. It passes on the northern foothills of Tell Dan. This east-west road was used by the French & British to mark the borders between Lebanon, Syria and Israel. A Roman bridge is located nearby. Banias Under the modern road connecting to the Golan, is the base of a Roman bridge. 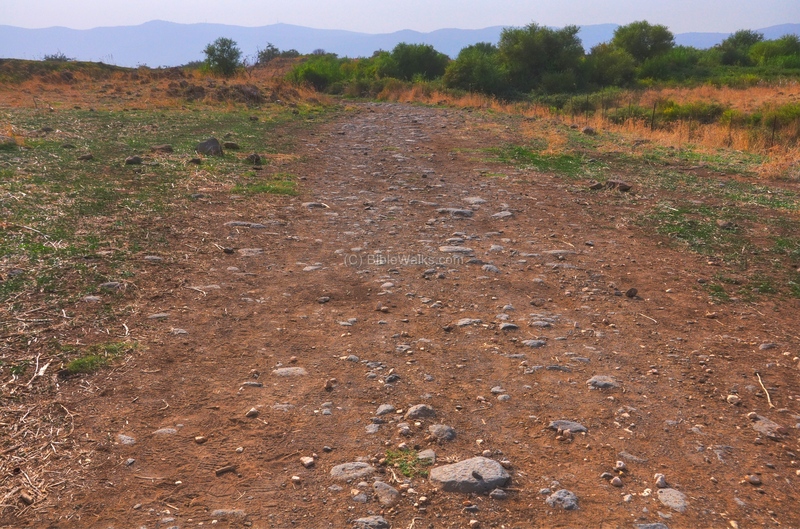 This was once a section of the ancient Roman road that led via Tell Dan to Damascus. Shavey Zion Two Roman milestones were found near Shavey Zion, and marked the 4th and 5th miles from Acre to Tyre (#309 and #310 of the Roman Acre-Syrian road that was built by Claudius in 56AD). 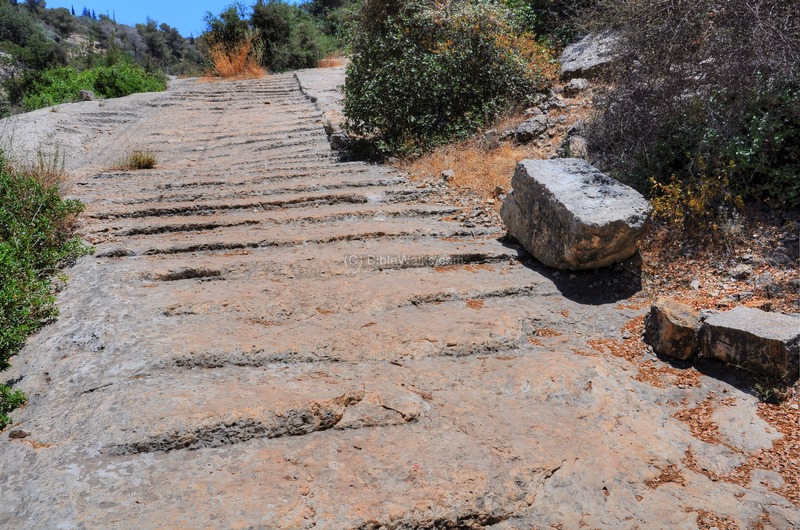 The Roman road from Emmaus passed through a narrow mountain passage named Nahal Ilan (Wadi A'lakah), and started here its ascent to to the Holy City of Jerusalem. 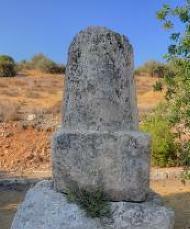 A collection of milestones is located on the side of the Roman road. 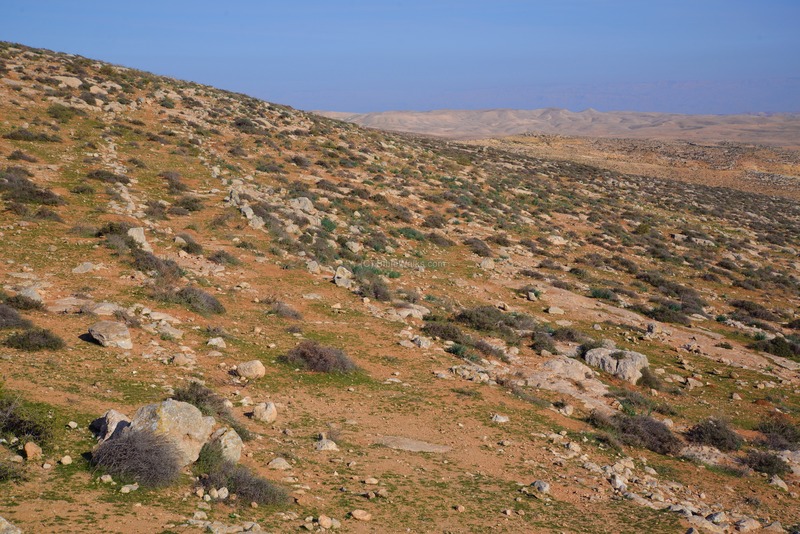 Horvat Hanut was a station along the ancient road ascending from the Elah valley. This road (aka. "Caesar's Way") was part of the Roman road from the coast city of Ashkelon, via Beit-Guvrin, to Bethlehem and Jerusalem. Sections of the Roman road can be seen along the modern road. Geres was a fortified village near the Roman road (aka. 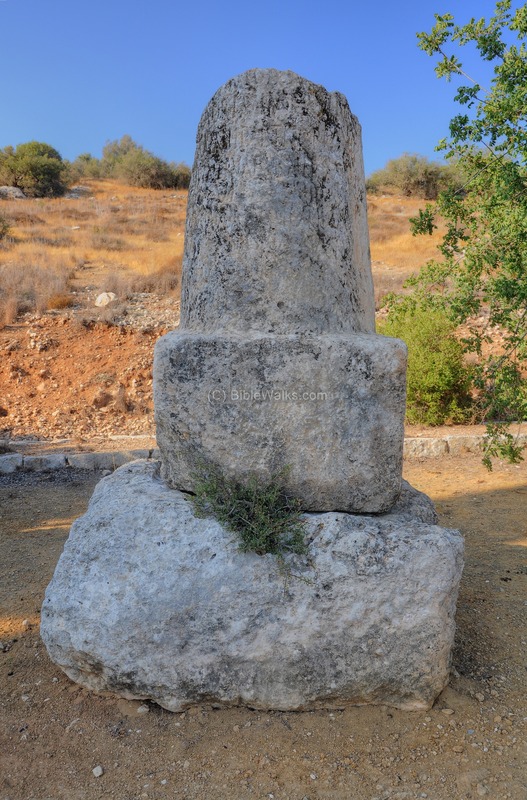 "Caesar's Way") from the coast city of Ashkelon, via Beit-Guvrin, to Bethlehem and Jerusalem. A section of a local road that connected the village to the main road is visible on the foothills of Mt. Kitron. 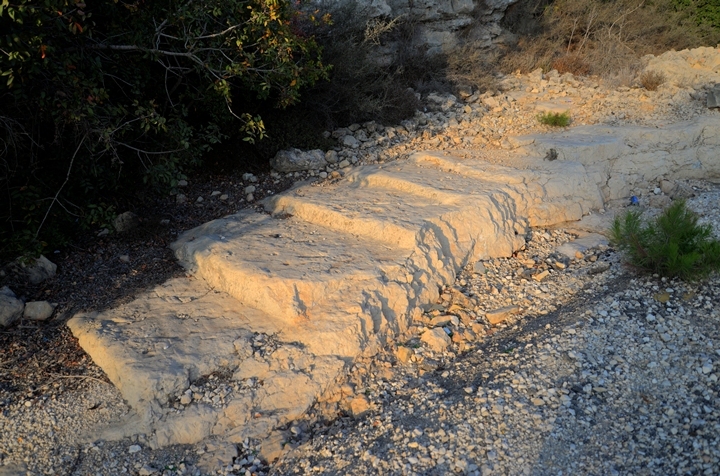 A section of the main Roman road, with carved steps, can be seen on the side of the highway, north to Geres. 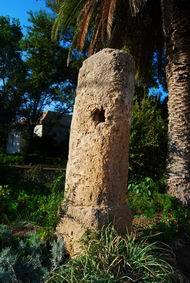 A Roman milestone is located under one of the arches of the Caesarea aqueduct, dated to the 2nd or 3rd C AD . 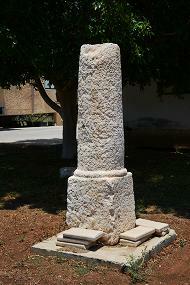 It indicated the distance of 4 Roman miles, probably the distance along the coastal road from Caesarea. A Roman road crosses the mountain above Kh. Kerioth, south of Hebron. This road connected the city of Hebron in the north and Malatha (where the regional Roman military cavalry headquarters - the Cohors I Flavia Equitata - were located during the Byzantine period). 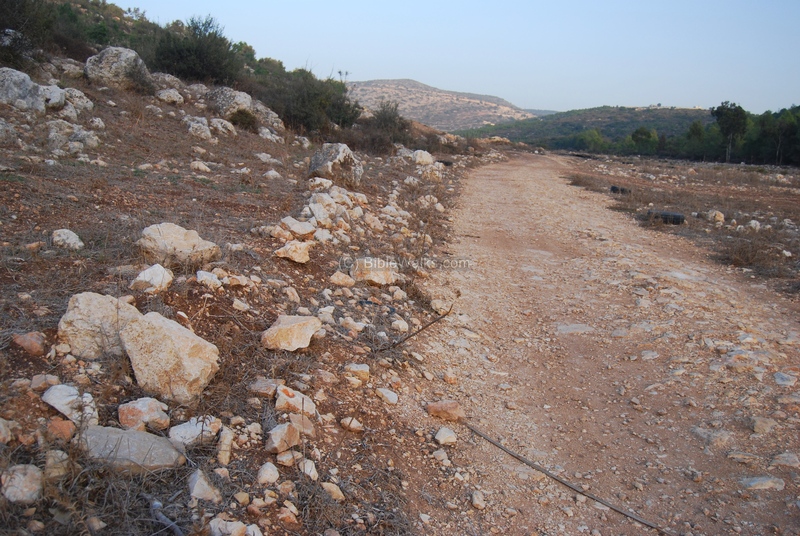 The road via the Valley of Elah was part of the Roman road from the coast city of Ashkelon, via Beit-Guvrin, to Bethlehem and Jerusalem. A group of 5 milestones are on display near the route of this road, just south of the Elah junction. A major Roman road passed on the east side of the Tel, connecting Beit Shean (Skythopolis) to Tiberias. 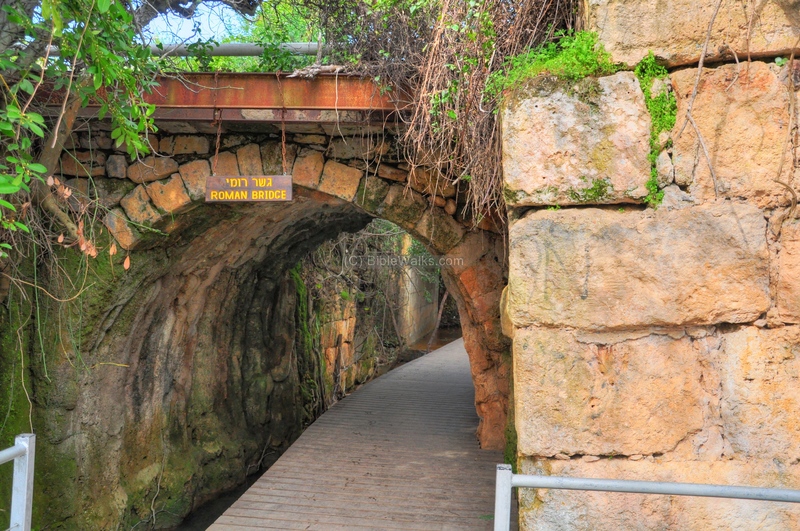 Many milestones of this imperial road were found around Beit Yosef, the nearby community. In front of one of the houses are two milestones, found by a local farmer in the 1980s. 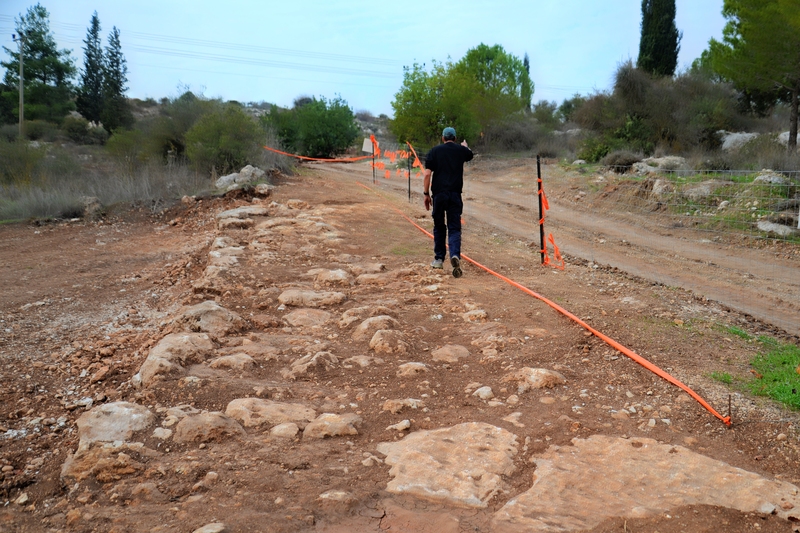 New excavations in 2016 unearthed a section of the Roman road leading to Beit Nettif, near Beit Shemesh. 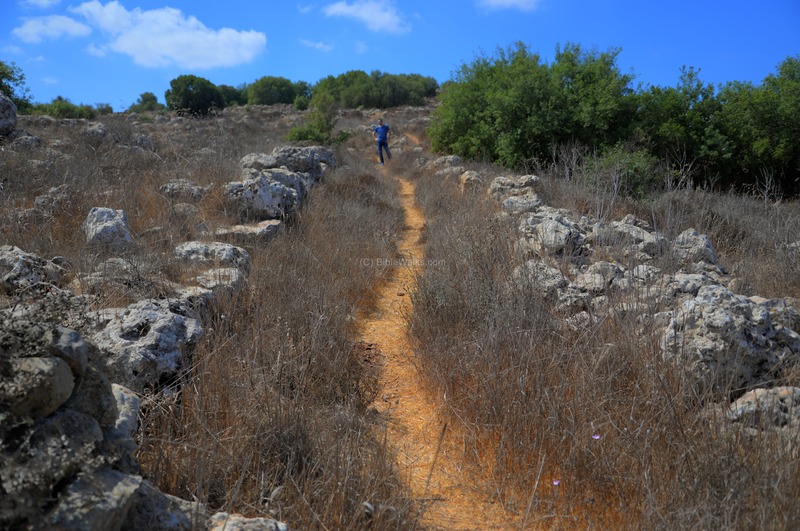 It may have been a section of the Caesar's way from Ashkelon, via Beit-Guvrin, to Bethlehem and Jerusalem. Josephus, the Galilee commander who fought the Romans, then served them as a historian, provides a fascinating description of the heavily armed Roman army, which justified rebuilding the old dusty roads of the Holy land. "But as Vespasian had a great mind to fall upon Galilee, he marched out of Ptolemais, having put his army into that order wherein the Romans used to march. He ordered those auxiliaries which were lightly armed, and the archers, to march first, that they might prevent any sudden insults from the enemy, and might search out the woods that looked suspiciously, and were capable of ambuscades. Next to these followed that part of the Romans which was completely armed, both footmen ,and horsemen. Next to these followed ten out of every hundred, carrying along with them their arms, and what was necessary to measure out a camp withal; and after them, such as were to make the road even and straight, and if it were any where rough and hard to be passed over, to plane it, and to cut down the woods that hindered their march, that the army might not be in distress, or tired with their march. Behind these he set such carriages of the army as belonged both to himself and to the other commanders, with a considerable number of their horsemen for their security. After these he marched himself, having with him a select body of footmen, and horsemen, and pikemen. After these came the peculiar cavalry of his own legion, for there were a hundred and twenty horsemen that peculiarly belonged to every legion. Next to these came the mules that carried the engines for sieges, and the other warlike machines of that nature. After these came the commanders of the cohorts and tribunes, having about them soldiers chosen out of the rest. Then came the ensigns encompassing the eagle, which is at the head of every Roman legion, the king, and the strongest of all birds, which seems to them a signal of dominion, and an omen that they shall conquer all against whom they march; these sacred ensigns are followed by the trumpeters. Then came the main army in their squadrons and battalions, with six men in depth, which were followed at last by a centurion, who, according to custom, observed the rest. As for the servants of every legion, they all followed the footmen, and led the baggage of the soldiers, which was borne by the mules and other beasts of burden. But behind all the legions carne the whole multitude of the mercenaries; and those that brought up the rear came last of all for the security of the whole army, being both footmen, and those in their armor also, with a great number of horsemen". Via - Latin for "road"
Strata (plural form of stratum) - Roman word for a "paved road", normally for military purposes. It is the root of the English word "street" . It is also used as an archaeological term - a level of earth, one of several horizontal layers. This is based on the structure of the roman paved road - a number of layers that were laid out to build a lasting road. Derech - Hebrew: road, way.